Will Winston call back the agents of Overwatch when they’re needed most? Watch “Recall” now to find out! 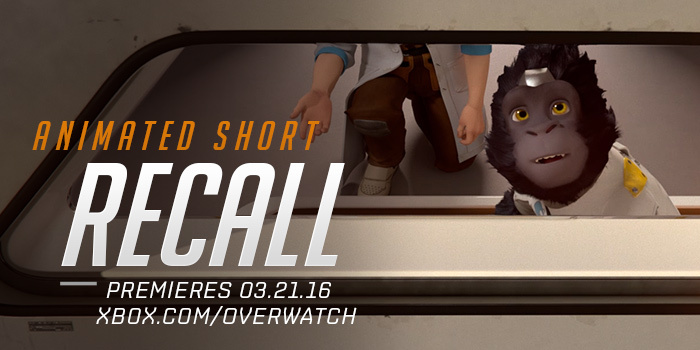 Imagination is the essence of discovery. . . .
Next Monday, delve deeper into the world of Overwatch with the premiere of our first animated short:Recall. “Recall” tells the story of Winston—a genetically engineered gorilla and brilliant scientist who longs for the days of heroism to return. In this episode, we explore Winston’s thoughts and memories as he wrestles with the decision to recall the agents of Overwatch, all while the forces of Talon stage an attack on his laboratory in the abandoned Watchpoint: Gibraltar. Mark your calendars: “Recall” premieres exclusively on Xbox.com/Overwatch March 21 at 12 p.m. PDT. If you live in the United States, be sure to tune in to Better Call Saul that night on AMC to catch a special 60-second teaser!